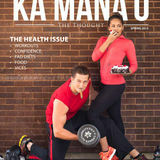 We are the student magazine at Leeward Community College. Students write, take pictures and do graphic design on the magazine. We also showcase creative works by students such as poetry, art, photography and creative writing.